Physician Spotlight Q&A: USMD Colorectal Surgeon Anna Toker, M.D. Be Seen, Get Screened's Physician Spotlight Q&A series highlights the work of health care professionals on the front line in the fight against colon cancer. In our latest Q&A, we talked to Dr. Anna Toker, a Colorectal Surgeon at USMD in Arlington, Texas. Recently, there has been a great deal of controversy over the health detriments of soda and how it is harming the health of both children and adults. Despite the importance of healthy eating habits and regular exercise, it can be a real challenge to get the whole family on board with your decision to get healthier. There is a large body of research to suggest that physical exercise can lower your risk for various types of cancers. As you age, maintaining an active lifestyle becomes more important than ever. Today our friends at Fight Colorectal Cancer kick off their Pitch for Prevention colon cancer awareness campaign in the Twin Cities area. Physician Spotlight Q&A: Medical Oncologist Dustin Deming, M.D. Be Seen, Get Screened's Physician Spolight series highlights the work of health care professionals on the front line in the fight against colon cancer. Our Colon Cancer Survivor Spotlight series gives a voice to the brave individuals who have battled the disease themselves. Our latest Q&A features a person who fits into both categories. The health care system in the United Sates is an important pillar of society, and brings together several societal realms to create programs that provide medical care for all citizens. One of the great things about raising awareness for colon cancer is that there are so many different ways to do it. Whether it's a like, a comment, a share, or a post of your own, getting active online is the easiest way to join the colon cancer conversation. Facebook plays a tremendeous role in colon cancer awareness. 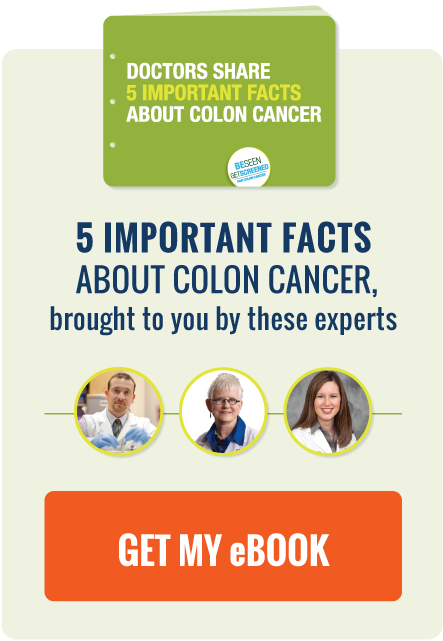 It is a great way to connect with friends and family, build support networks, learn and distribute valuable information, and find organizations founded specifically to help patients, families, and advocates get the word about about colon cancer. Some of our biggest supporters here at Be Seen, Get Screened come from the brave group of people who have survived colon cancer themselves. To highlight their experiences, we regularly feature survivors in Q&As here on the Be Seen, Get Screened blog. Our latest Q&A profiles Fiona Finn, a realtor, author, mother, and colon cancer survivor. At just 41 years old, Fiona discovered she had Stage III colon cancer. As if her diagnosis wasn't daunting enough, her husband filed for divorce six months into her cancer battle. If you are age 50 or over, you've heard it before - you need a colonoscopy. But why do you need one? How often should you get one? What exactly is a colonoscopy? The Be Seen, Get Screened social wall is a great place to learn the latest news on colon cancer and colon cancer screening, and join in the conversation yourself! The 4th of July is a fun time to get together with friends and family, play games, enjoy the weather, and most importantly - eat! Smoothies can be great sources of several essential nutrients your body needs to stay healthy. They're packed with vitamins, minerals, and dietary fiber, and the best part is you can make them exactly how you like them!